The modern world is rapidly developing and becoming more complex. The tasks that people deal with become more difficult from year to year. Special knowledge and skills are required to solve them. Moreover, the main difficulty lies in the fact that you need to have a wide variety of personal qualities, knowledge, and skills to perform a certain task. As a rule, one person can not fulfill all the necessary functions independently. In this regard, the problem of creating effective teams that could solve a variety of tasks in terms of quality and complexity became very urgent. As it is a rather difficult task to create a result-oriented team, the best solution will be to delegate the task to the outsourcing company, one of which is Mobilunity, IT staffing Ukrainian firm. Consider the next features of cooperation and you will have no hesitations about what to do next. It is also necessary to mention that Mobilunity can provide you with a dedicated team of developers who specialize in such modern technologies as PHP, .Net, Java, Angular, Laravel, Magento, and many others according to the specifics of your project. 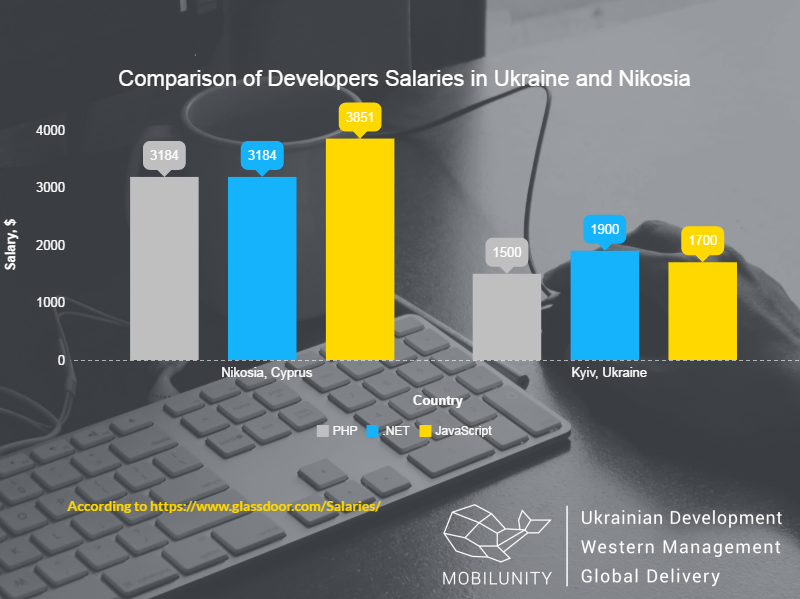 Answering a question if it is really beneficial to hire developers in Cyprus, first of all, we should compare average salaries of Ukrainian and Cyprus developers for hire. 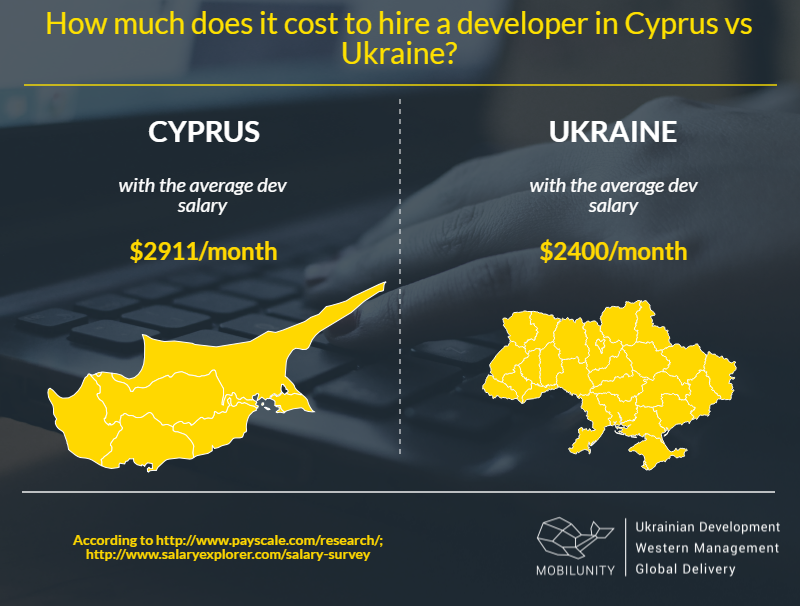 An average developer salary in Cyprus is $2911, while this wage in Ukraine is close to $2400 per month. Cyprus dedicated team can be hired in such cities as Nikosia, Pafos, Larnaka and Limassol. We will discover how much does it cost to hire developers in Nicosia compared with Kyiv according to the skills of developers. a .Net developer will ask $3184 for his work. .Net developer’s skills are evaluated at $1900 in average. Where to find and hire developers in Cyprus or in Ukraine? It is possible to conclude that hiring a dedicated team in Ukraine is not only more beneficial from the financial side, but you also will receive all the above-mentioned advantages of outsourcing with Mobilunity. You can hire developers in Cyprus or contact our experienced team now to learn how to save up to 60%!